The central paintings A Fundação da Vila de Santos –1545 presents raise of Santos people to category town. Sao Paulo genealogy is highlighted by personage composition. You can observe settler families and social structure organization composed by civil, religious and militate groups. The quantity of buildings which integrate to this scenery indicates Benedicto Calixto intention of presenting Brás Cubas not as a founder, but a Portugal Crown official representative, which legitimizes and organizes political and legal institutions from people already consolidated. The painting which retracts period of 1822, it shows a small village, with some streets and many churches. Few vessels and people concentration restricted to pier region reveal an economic activity still in development based on, mainly, sugar exportation. In Porto de Santos em 1922, all transformations unleashed by coffee commercialization can be observed: a modern port structure, the advent of railroad and planned urban development. You can also see architecture change, from old and modest colonial constructions for noble eclectic style palace. These moldings retract some examples of Brazilian fauna and flora. They were projected by Benedicto Calixto and prepared by artist Ângelo Guido. 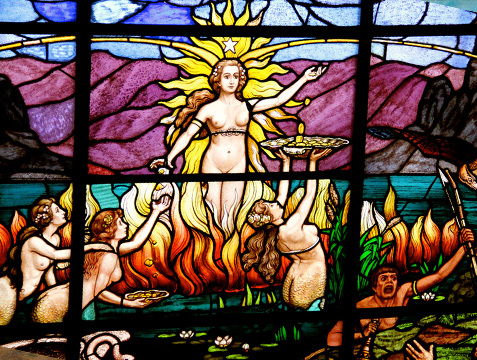 The stained glass A epopéia dos bandeirantes was projected by Benedicto Calixto and prepared by Casa Conrado, São Paulo famous stained glass atelier. It was presented during opening of Bolsa Oficial de Café building in September, 7th 1922. In this art work, the artist used allegory and symbolic settings to represent history periods which featured economy, policy and urban and social conjuncture of country. The idea was making the “first typically Brazilian stained glass” with colors and light of Brazil. This stained glass is divided into three scenes, which represent three great periods of development in Brazil. 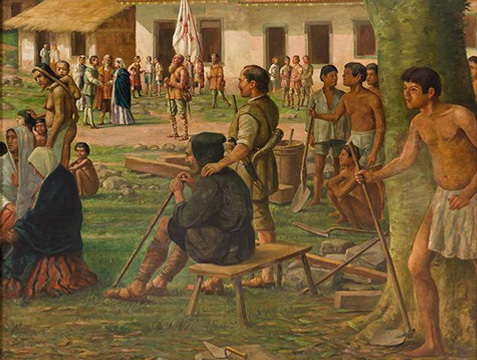 In central scene named Colonial period: In A conquista do sertão pelos bandeirantes, you can observe the meeting between Portugal Bartolomeu Bueno da Silva, known as Anhanguera (old devil in Tupi language) and mother of gold which, rounded by mothers of water, showcases richness of our land in the midst of nature. In work art, you can identify Roman mythology and symbols related to economic activities, like god Mercury in work art A indústria e o comércio and god Ceres in A lavoura e abundância.